Repentance is a lifestyle; be ready! 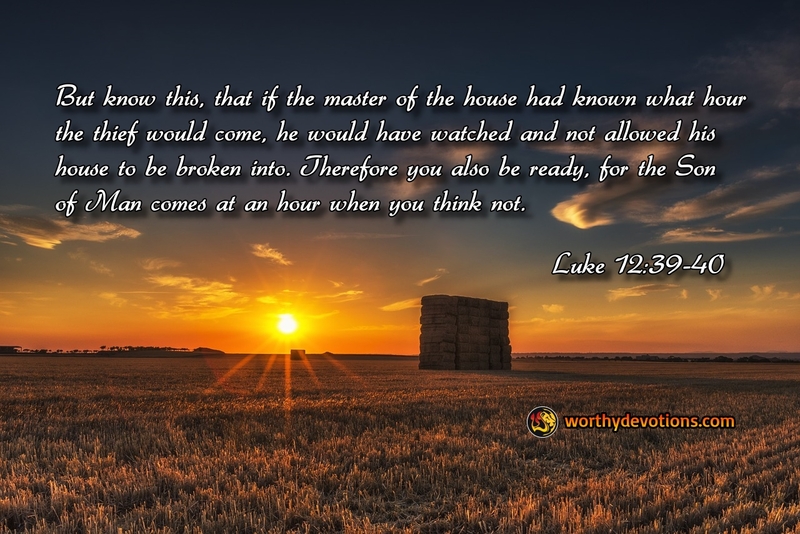 Luke 12:39-40 But know this, that if the master of the house had known what hour the thief would come, he would have watched and not allowed his house to be broken into. Therefore you also be ready, for the Son of Man comes at an hour when you think not. When studying the Jewish roots of many of Yeshua's (Jesus') parables, and I came across an interesting saying from a Jewish Rabbi that I believe has something to teach us. Rabbi Eliezer said, "Repent one day before your death." His disciples asked him, "Does then one know what day he will die?" "Then all the more reason to repent today", he replied, "lest he die tomorrow, and thus his whole life is spent in repentance." When I first became a believer, I thought by simply dealing with my outward sins that I could live a state of sinlessness. But it wasn't long before the Lord began revealing and dealing with my inward sins and attitudes. Now, and the longer I walk with Him, I understand more and more the meaning of daily repentance! If we truly want to be free and walk in His liberty, we cannot avoid this crucial requirement for freedom. Because we cannot receive His forgiveness without it, repentance must be a way of life for us [1 John 1:9]. Staying close to the Lord is His heart's desire for us...but one of the main conditions for it is walking in regular repentance. When we walk in humility and truthfulness about our sin -- we are walking in the light, and the blood of Jesus keeps cleansing us from sin. In that condition we are so much more able to love the Lord and those around us -- with Him, touching one life at a time. So, let's lay down our pride and turn to Him every day....with genuine repentance!